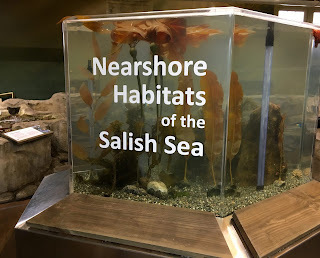 During this season of giving, the Port Townsend Marine Science Center is celebrating the connection between marine animals and humans, and the power of these amazing ambassadors to inspire tens of thousands of people each year to become stewards of the Salish Sea. Please consider gifting others with this connection by making a donation to the PTMSC -- Thank you! This is Part 1 of a two-part series, To read Part 2, go here. 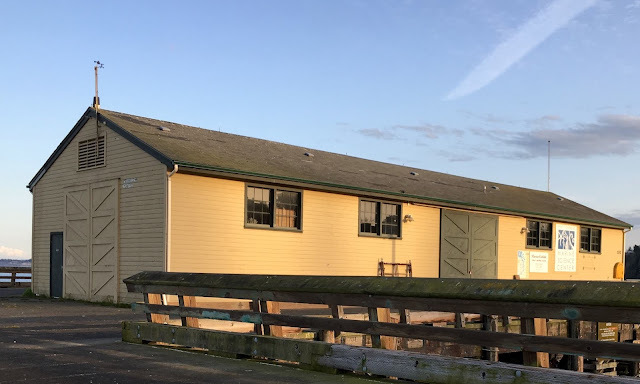 The Port Townsend Marine Science Center Aquarium, on the pier at Fort Worden State Park. Staff photo. In 2018, visitors to the Port Townsend Marine Science Center Aquarium, located on the dock at Fort Worden State Park, got a first-hand look at the facility’s re-imagined plant and animal displays, as well as a new conservation lab. 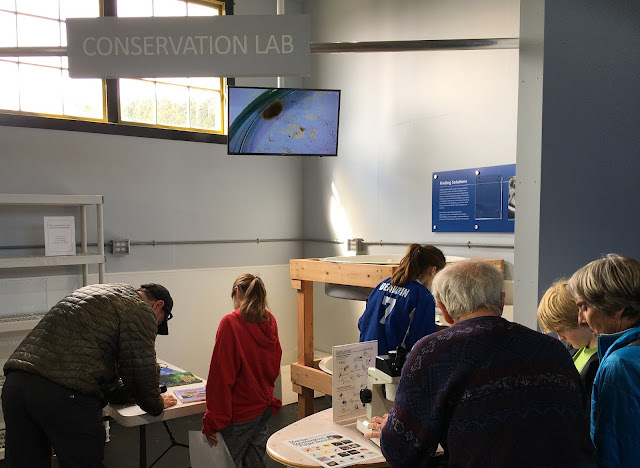 Conservation Lab, newly established in 2018! Staff photo. 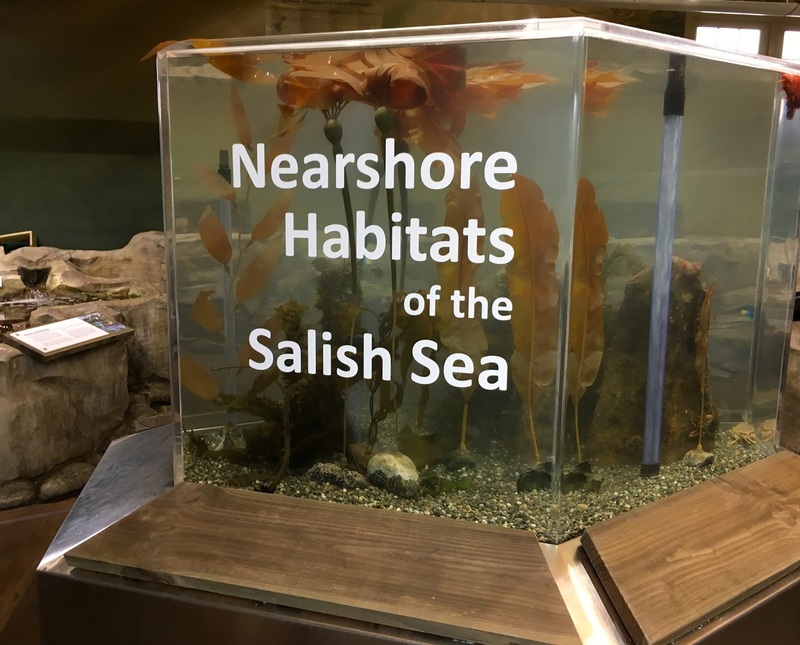 The exhibit redesign, overseen by PTMSC Program Director Diane Quinn with the support of staff and volunteers, showcases the typical plants, animals and underwater features found in a number of nearshore habitats. including plants and animals, at the Aquarium. Staff photo. 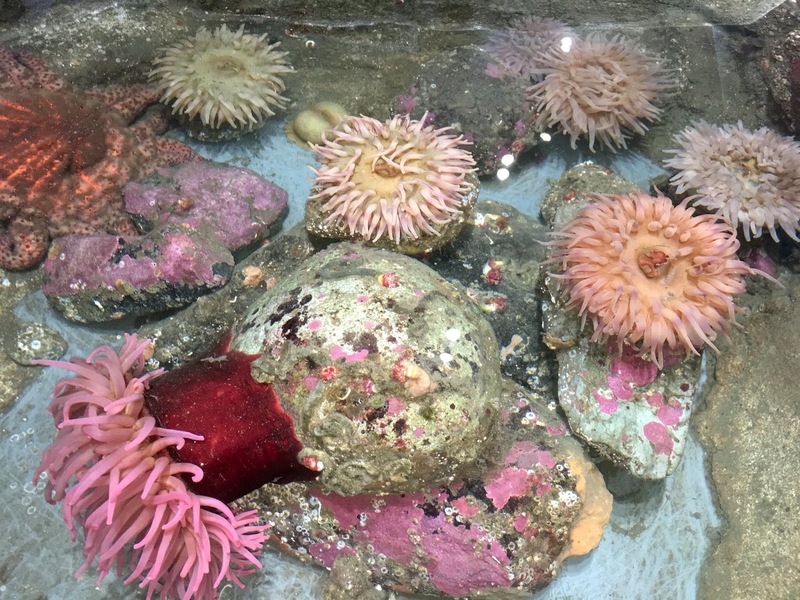 As a result, visitors who interact with the popular tide pool touch tanks and aquarium exhibits can better understand how these marine organisms thrive within the larger ecosystem of the Salish Sea. Below the crumbling bluffs and along rocky points, waves crash relentlessly against the shoreline of the Salish Sea. The animals living here are tenacious, possessing an extraordinary ability to cling tightly to their anchor points to avoid being swept away. Why risk life in such a hostile environment? 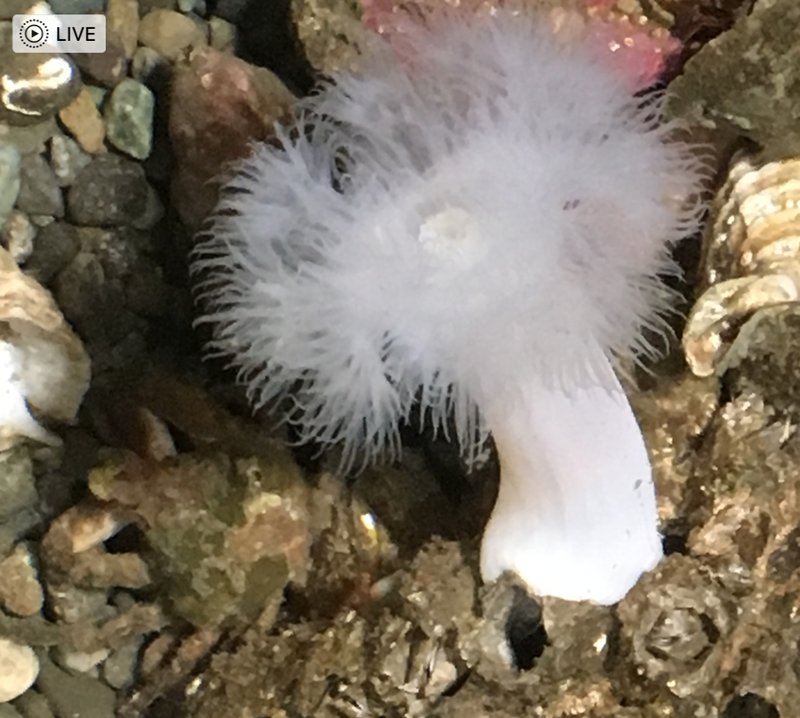 Because the cool, upwelling waters are full of nutrients and microscopic organisms that the tough residents of this dynamic zone filter out and feed upon. In the aquarium’s surge zone tide pool, visitors can see anemones, urchins and sponges “stick” themselves to rocks. Meanwhile, limpets and other snails seal themselves in place with a muscular foot, and blood stars use their tube feet to anchor themselves. Barnacles grow in large clusters by cementing themselves to hard surfaces. The clingfish lives up to its name, using its pelvic fins as a suction cup to hold tightly to rocks or blades of seagrass. At low tide, marine animals are exposed and the sun beats down, while seagulls, otters, and other scavengers patrol for a meal. Hermit crabs and fish take refuge in pools or under rocks to avoid exposure, while anemones and barnacles close up tightly for protection against both sun and predators. At high tide, the cool waters offer relief to those hardy enough to live in these extremes. Mussels and other sedentary filter feeders rely on these nutrient-rich waters to deliver their meals to them. Living in the rocky intertidal tide pool are some of the aquarium’s most popular (with visitors, that is) creatures: fish-eating anemones, red and green urchins and mobile predators such as ochre stars, mottled stars, sunflower stars and crabs searching for mussels, limpets, chitons and other food among the rocks. Filmed by PTMSC Intern Jonathan Crossman. 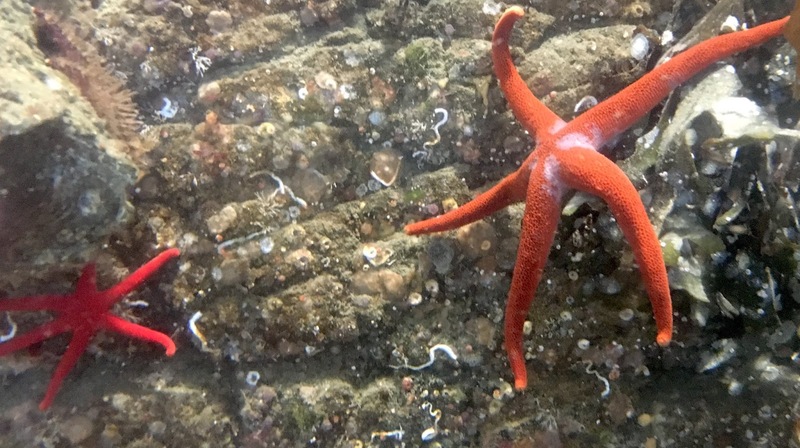 Below the stresses of the dynamic rocky intertidal zone, but still within reach of the sun’s rays, rocky reefs are home to countless species of fish, invertebrates, and seaweed. Boulders and rocks create refuges from strong currents and provide the hard surfaces to which invertebrates attach. Fueled by the sun, seaweeds and kelp wave in the strong currents while coralline algae create startling bright pink patches across the rocks. Tubeworms and scallops grab small particles of food from the passing water. Leather stars scout for urchins and anemones while sea cucumbers scour away plankton and detritus. Fish, such as sculpin, feed among the rocks and take shelter from diving birds and mammals above. Anemones and a sunflower star (do you see it? ), staff photo. 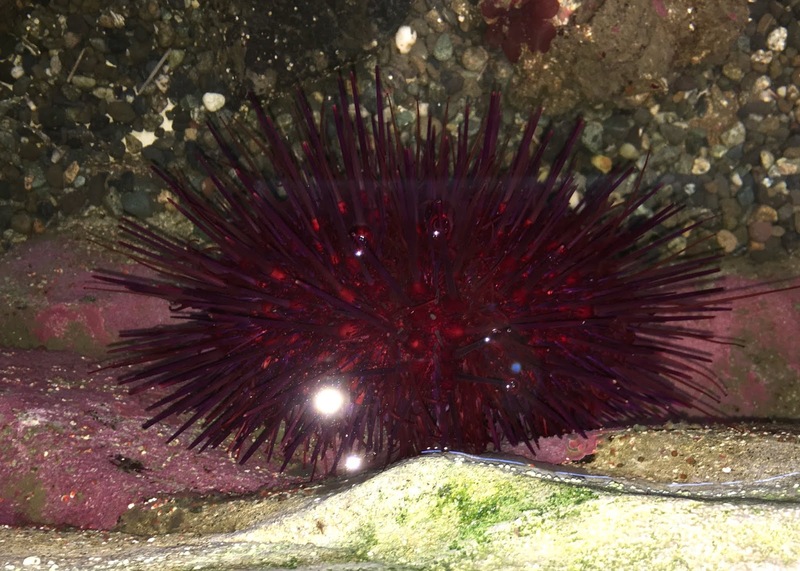 The red sea urchin uses its tube feet, located between its spines, to help move across the sea floor in search of kelp. Fortunately in the aquarium, the hungry sea stars, anemones and urchins don’t have to move much to find a meal – they are fed by reliable human caretakers! Visitors peering over the aquarium’s railing can view grass growing underwater. This zone – the seagrass meadow – is one of the most productive and valuable habitats in the Salish Sea, providing a nursery for numerous fish species and food for invertebrates. The grasses also stabilize sediment, filter harmful bacteria and absorb carbon and nitrogen. Red sea urchin, staff photo. One of the most prolific species of seagrass is eelgrass. This perennial, flowering, narrow-leafed plant thrives in sandy sunlit shallows. Anchored by interlocking roots and growing up to six feet tall, eelgrass slows water movement and wave action, protecting the shoreline and capturing marine nutrients. In addition to providing habitat to diverse marine life, its decomposing leaves contribute significant amounts of organic nutrients, boosting productivity in surrounding areas. 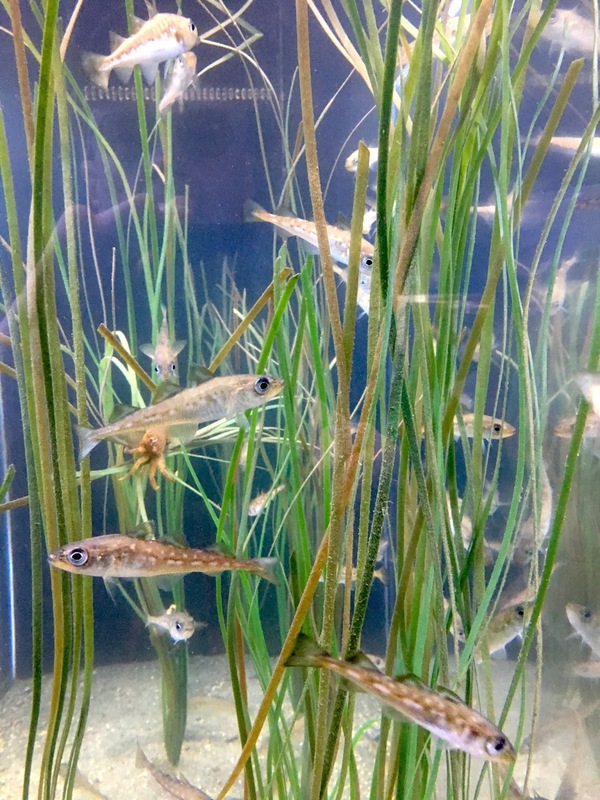 Juvenile walleye pollock in the eelgrass tank, staff photo. 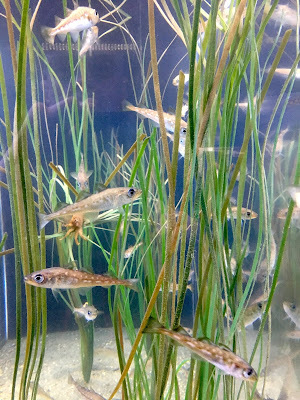 In the aquarium’s tanks, visitors can view some of the fascinating species of fish found in seagrass beds, including tubesnouts, pipefish (a close relative of the seahorse), prickleback, greenling, gunnels, sanddabs, tadpole sculpin and juvenile walleye pollock. Some feed on the algae that grows on the leaves, while others hide among the blades and await tasty morsels floating by.